Brian Pigg’s adventure fantasy chronicles a young priestesses’s quest to retrieve stolen artifacts, delivering a highly entertaining and thematically profound reading experience. Katelarin, a devoted priestess of the goddess Mirsha, has spent five long, uneventful years in Theopolis, the City of Temples. Her existence is decidedly unfulfilling, but a visitation from the goddess changes everything. 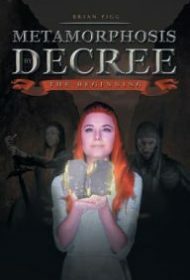 Mirsha informs the disillusioned priestess that she must recover the lost Tablets of Markinet—holy relics allegedly stolen by a group of evil mages who now live in the Black Tower. Kate gets little help from the governing body, which is patriarchal and ruled by sexist elitists who think a woman can’t possibly lead an important quest. But with Mirsha’s words empowering her—“Only you can free us”—the priestess enlists the services of a female warrioress, a disgraced knight, an untrustworthy thief, and others to aid her in somehow finding the mythical Black Tower and the immortal mages within. Their journey is fraught with peril, and the band of misfits are challenged at every turn. When they finally reach their destination, revelations force Kate to reevaluate her place in the world yet again. The idiom “don’t judge a book by its cover” is fitting here. The poorly rendered cover art and forgettable title are not indicative of the fast-paced, action-packed fantasy quest within. Tonally, this debut compares to classic sword-and-sorcery sagas such as Leiber’s Fafhrd and the Gray Mouser and Moorcock’s Elric of Melniboné, but it’s the endearing female lead character and deep exploration of gender roles throughout that make this so memorable. Despite being oppressed by centuries of patriarchal rule and religious-based sexism, Kate is able to use her intelligence and courage to pursue her heroic goals. This is an epic quest, powerful coming-of-age tale, and significant social commentary wrapped in a rip-roaring adventure featuring pirates, demons, and immortal black mages. Readers will want to buckle up and enjoy the ride!